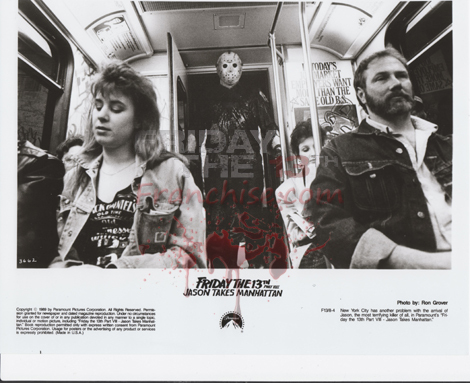 Marketing Friday the 13th films are relatively easy nowadays as social media websites quickly disburse news, photos and trailers for films months before they are released in theaters. 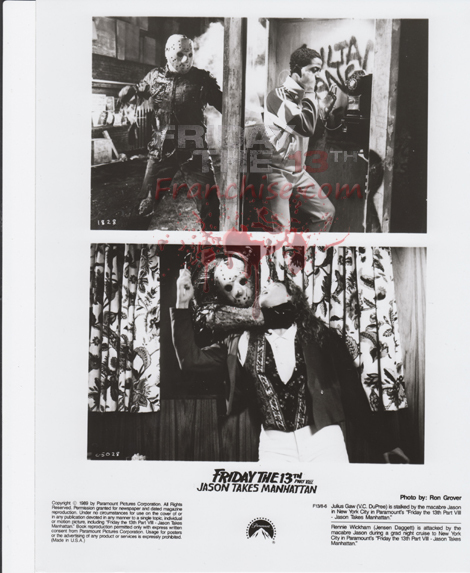 Back in the Paramount Friday the 13th era, with no Internet to utilize, the distributor prepared Press Kits with photos and a film synopsis for theaters and news outlets to understand the film that was being put into theaters. Press Kits are still utilized on occasion today, but usually are sent to writers and theater chains either on DVD, flash drive or downloadable on a website. 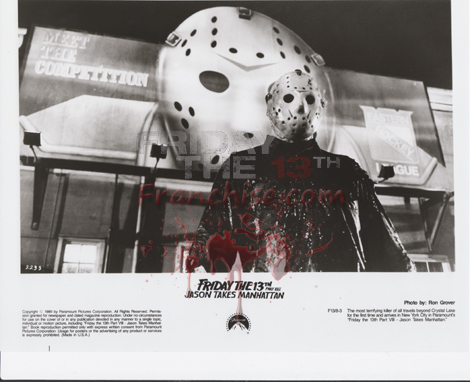 Over the next few weeks, we are going to review Friday the 13th Press Kits created by Paramount and New Line Cinema. These kits are made up of folders booklets and glossy photos as well as a few surprised here and there. 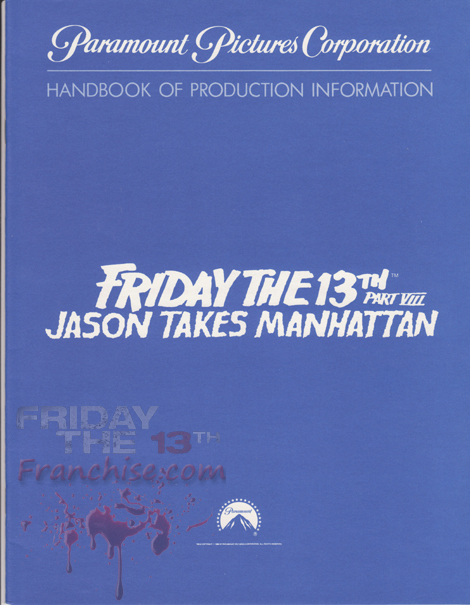 Today's Press Kit is for Friday the 13th Part 8: Jason Takes Manhattan. This kit is probably the most fun to own out of all of the Paramount offerings as it showcases Jason in most photos as well as contains two postcards with Jason Voorhees! Below is the original folder and Production Handbook that comes with the kit. The Handbook contains information about the plot of the film, the actors and crew and a little history on the film franchise. Next is the postcard. There are two postcards included in the Press Kit and is the most creative asset of this kit. 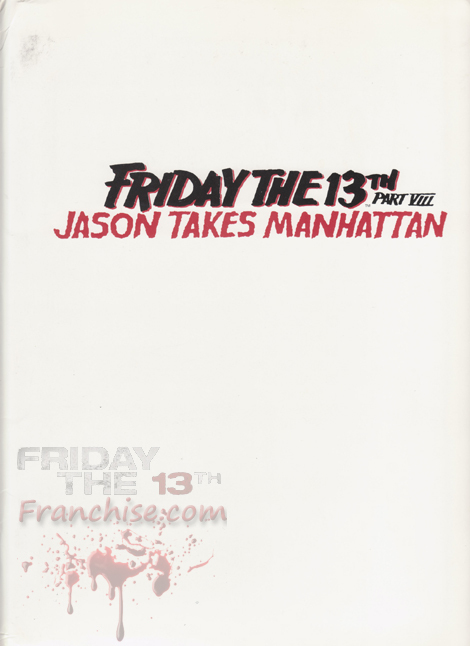 On the front of the postcard is Jason standing in front of the impromptu Subway entrance created for the Times Square scene. On the back of the postcard it reads "Wish You Were Here - Jason" in blood red. The last items of the kit are the glossy photos. Descriptions of the scenes shown on the photos are given underneath the pictures. Pictured below are four of the photos with three others excluded as one is a duplicate and the others are just headshots of the actors.